What Is A REM Pod & How Does It Detect Ghosts? There are plenty of ghost hunting gadgets around, the REM Pod is just one of them and it's not the cheapest but is it worth the money? How exactly does it work and is it reliable? The REM Pod, or radiating electromagnetism pod, gets its name from its point of difference to other ghost hunting tools, it radiates its own electromagnetic field. Traditional electromagnetic flux meters used in the paranormal field are tuned to detect the fields produced by flowing currents of electricity or the radio frequencies emitted from broadcasting devices. Because the REM Pod radiates its own EM field it can detect much more, which in theory makes it easier for spirits to use the device to communicate. The REM Pod can detect a difference in field strength when a conductive material enters into its EM field. This means it can detect things moving in and out of its fields, which from a ghost hunter's point of view is hopefully spirits approaching the device's telescopic antenna, which allows for 360 degree coverage. When the devices triggers one of five coloured LED lights illuminate. Each of the five lights, red, green, blue, yellow and purple, are accompanied by a distinct audible tone to indicate the strength of the field disturbance. So, let's get scientific. What actually is a REM Pod? Well, it's essentially a capacitive circuit paired with an oscillator to generate an EM field. It's all wrapped up in a 12cm cylindrical shaped case with the five lights and the 25cm extendable antennae sticking out of the top. The technology is nothing new, the device is basically a modified theremin, a musical instrument invented by the Russian scientist, Lev Sergeevich Termen in the 1920s. Unlike other musical instruments, the theremin is played without making physical contact with it. Just like the REM Pod, the closer the musician moves their hand to the instrument's control antenna, the higher the note that is emitted. When on a ghost hunt, the REM Pod is designed to be left in a location you're investigating, rather than being carried around as a handheld device. They can also be used in multiples to track the movement of energy across a room. The idea is to call out to any spirits that might be present and encourage them to interact with the device. Remember when doing this not to use jargon, ghosts are unlikely to know what a REM Pod is so encourage them with phrases like "can you move towards the glowing box in the middle of the room." There's five levels of sensitivity, set using a switch on the base of the device, this determines how close something or its energy needs to get to the device in order to trigger it. The REM Pod also has automatic baseline adjustment. This means that if a conductive object fell into the device's field, or something nearby was switch on to produce a field, after a few seconds the REM Pod would ignore it and readjust. The REM Pod also has a useful function called ATDD, or Ambient Temperature Deviation Detection. The pod will make either a high or low pitched sound to indicate a sudden change in the air temperature. This is accompanied by a visual signal in the form of a red or blue light. The ATDD feature is triggered by changes of +/- 5 degrees Fahrenheit. 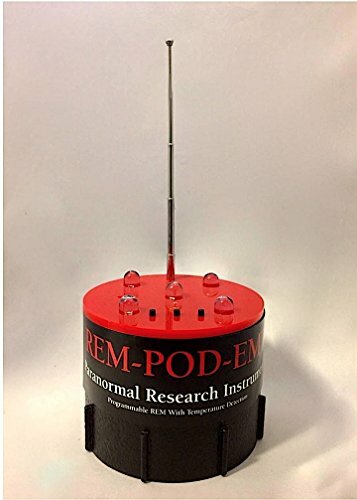 The REM Pod is a good alternative as a lot of paranormal researchers have voiced their skepticism of traditional EM meters as a means for detecting spirits. Their doubts are based on the fact that classic EMF meters, like the popular K-II, can't detect any electromagnetic field around a human body, even when the device is held against the skin or next to the head, even with all those firing synapses in the brain. If the device can't detect a human, why should an EMF meter be able to detect a spirit? The REM Pod doesn't suffer from this issue, it can be triggered by a human or animal getting too close to it. This makes it easier to believe that a spirit could also affect the device. The device can be triggered by things like mobile phones and walkie talkie, so this should be accounted for when investigating. Phones should be turned off and results discredited if a radio is being used. REM Pods are also susceptible to interference from things which might be beyond your control like baby monitors, radio transmissions and even fluorescent lights. I recently used a REM Pod on a ghost hunt, and the device did trigger and seemed to respond to questions. What I found most interesting was that the device didn't trigger at any other point during our five hour investigation in the property, even though it remained in the same location all night. The REM Pod is made by a US company called DAS, who specialise in tools designed for paranormal research. Their devices are regarded as some of the best in the field and have become the industry standard for paranormal groups, TV shows and researchers across the globe. This is the latest REM-POD version and was released in May 2017. The REM-PODs antenna will alert of any EM field disturbances / manipulations around it. One can now set the sensitivity range for that coverage. Also, new is that one can set the level of EM that is the zero (baseline) for the environment being investigated. The REM-POD Displays the Field Disturbance Using Multi-Colored Light Columns and Audible Tones which varies depending on proximity and strength of the source. The REM-POD also has ATDD function. ATDD = Ambient Temperature Deviation Detection. If the temperature surrounding the REM-POD increase or decrease the REM-POD will alert you for every +5/-5 degrees Fahrenheit.